In most cases, when a new FireWire or USB hard drive is plugged into Windows 2000 or XP, you will see a wizard appear as soon as you open the Disk Management snap-in. This wizard makes it easy to initialize the drive for use on Windows based systems. In some rare cases, this wizard does not automatically popup. This makes the initialization process more difficult. The details below will walk you through the necessary step to manually write a signature to the disk and then begin the initialization process under Windows 2000/XP. This screen capture should be similar to what you have on your screen. You should see the Disk 1 labeled Unknown in the bottom right corner of you screen if the Signature Wizard never appeared. Right click on the name portion of the line that contains Disk 1 (the grey label where you see the red caution sign). This spot is marked as location A on the above image. There you will find an option to write a signature. 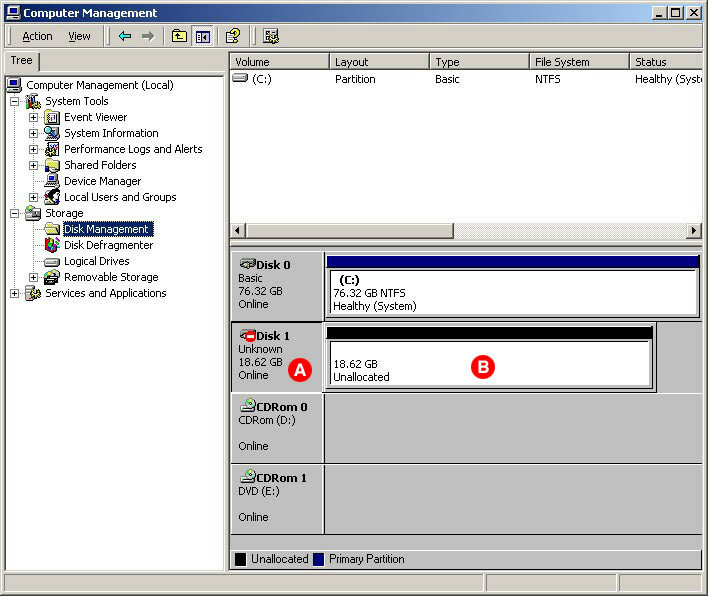 Once the signature is written to the disk, right click on location B and chose the option called Create Partition... This will initiate the wizard that will help you initialize the disk. The wizard will walk you through the steps needed. When you have the option, be sure to the partition type, choose Primary Partition. The rest of the procedure is self-explanatory.